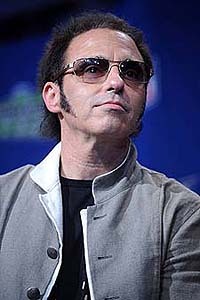 It is hardly surprising that, in 1984, when Steve Van Zandt quit Bruce Springsteen’s E Street Band to pursue other interests, the first person that Bruce called up to fill the gap was Nils Lofgren. He is known as ‘the musician’s musician’ and for good reason. As well as being a gifted guitar player he is just as accomplished on the piano, accordion, mandolin, pedal steel, dobro, lap steel, and banjo as well as possessing a beautiful singing voice. It was very clever of Springsteen to get Nils on board; he wasn’t just hiring a musician but many musicians. Not that Nils hadn’t enjoyed a sparkling career before Bruce came calling. Born in Chicago in1951, he was just 17 years old when he was invited by Neil Young to play piano and guitar on Young’s seminal album After the Gold Rush. Following that, Nils enjoyed success with his own band ‘Grin’ before launching a solo career which he still enjoys to this day, albeit, interrupted by the occasional call from Mr. Springsteen. Also a talented song writer, Nils is best known for the songs; Cry Tough, No Mercy, I Came to Dance, Keith Don’t Go and Black Books (which was featured during the closing credits of an episode of The Sopranos). 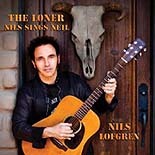 In September 2008, Nils released ‘The Loner – Nils Sings Neil’. A collection of 15 Neil Young songs that has been widely acclaimed by both critics and fans. The songs had carefully been chosen from Neil Young’s forty year career, and include songs that date back to his Buffalo Springfield days and early solo albums alongside more familiar material from Gold Rush and Harvest Moon. Nils lovingly brings his own style and magic to these songs in a stunning solo acoustic performance. Currently, Nils is rehearsing with the E Street Band ahead of the ‘Working On A Dream’ tour that kicks off in San Jose on April 1st. I was lucky enough to catch Nils at his Arizona home and I asked him a few questions about his career. The first thing I must ask you is; how was playing the Super Bowl? "It was a fun gig and Bruce did a great job. It was twelve minutes, it was fine, at that point, because of my recent surgery (see below), I was glad it was a twelve minute show and not a three hour show. My wife Amy came out to be there with me. I’m a big football fan and my local team, the Arizona Cardinals, were there, although it was a painful loss as a football fan." "I met up with John Madden, the famous football commentator, who is an old friend. I used to do the music for his All-Madden Teams. I did original rock and roll for nine years for him, so we put out a CD called ‘Tuff Stuff - The Best of the All-Madden Team Band’ which has some roaring instrumentals. John was kind enough to put some Madden-esque expressions beside the music; so there’s something there for football fans and rock fans alike. It’s probably the only instrumental album I’ll ever get to make. The Super Bowl experience was another confluence of chapters in my life and career coming together and made for a very fun week for us." 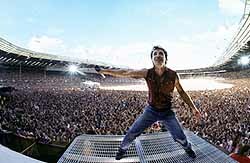 With the E Street Band you play in front of thousands of people at stadiums all over the world yet you still go out and play small venues; like The Robin in Bilston, UK. How do you balance your solo career with playing in the E Street Band? 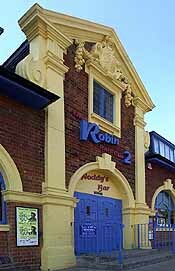 "The Robin 2? I love playing The Robin, that’s a funky place. We usually set up the ping pong table in the afternoon and have a game with the English crew. You know I love those places in the UK, I’m usually there in the Fall and I miss those places." "Actually, those little clubs, where you have the audience right on top of you, are a great challenge and help get you going with the music right away. You know I’ve spent forty years being a band leader; I love to lead bands and feel very comfortable with it. I found early on, I love being in great bands. I like being on a team. There are a lot of things I can do in a great band if you are not the band leader. If you are a singer or the band leader you are dealing with non-music issues all the time, and of course you are singing all the time. So, out of respect for the song and the lyric you can’t be singing and playing a too intricate secondary part, or a pedal steel guitar or dobro: you’ve got to sing. It’s fun, and I love to do it, but stretching out and doing improv solos in front of people and challenging yourself is what I have done my whole life. It’s nice to have someone else do that." "With Bruce I get to do a lot of cool things in a band that I don’t get to do as a band leader. So it’s all become part of my career. I’ve been in many great bands; Ringo’s All Star Band, Neil Young, Bruce and Patti Scialfa. It’s been great fun and I realise when I play in someone else’s band that it‘s a nice healthy break from being the leader, but it’s not a break from music. So, I’m continuing to hone my musical skills but I’m getting a break from always being the boss and it has really been a blessing on both sides." Your latest album ‘Nils Sings Neil’ was very well received by the critics; what was the inspiration behind it? "Yes, the album has been very well received. Although I have no idea how many it has sold. I sell the CD through my website. It has been fifteen years since I was last signed to a record company and life without a record company suits me very well because it is too political. It was a project that was my manager’s idea. It was a beautiful stroll down memory lane. Neil Young and David Briggs were two of my great inspirers and mentors growing up and they continue to be. The album was co-produced by David Briggs and even though David has passed away he still has a hand in my life. I was grateful for that and it was a great project to do." Your website has on-line guitar lessons, I’ve been told that you’re really proud of these videos; how did they come about? "I did the first rock and roll fantasy camp in the nineties for VH1 and I realised when I was sitting in a room with people, who didn’t know much about guitar and wanted to learn, that I was very comfortable with the teaching experience. I got tired of people saying that they wanted to play the guitar for fun but they weren’t allowed to because they didn’t have any talent or rhythm. If you just want to play for fun you just need a good teacher. So many people lose interest because it is frustrating as you have to get your hands to do gymnastics which they don’t want to do. So I try to teach people things to play with just one finger that sound and feel like music." "Then, right away, they can play along with me. I keep counselling and warning people that if you’re crazy and you want to keep going for two hours that’s fine, but if after twenty minutes you get frustrated take five minutes to do the one fingered stuff that feels and sounds like music so tomorrow they’ll feel like coming back. After ten years of classical accordion studies and forty two years of guitar playing I feel like I have a purpose to share, so that’s what this school is all about." This summer you will be in the UK at the same time as Neil Young. Is there any chance of us Brits seeing the ‘dream ticket’ of Nils, Neil and Bruce on stage together? "Probably doubtful. Last year it was a great frustration, I had Neil’s schedule and there wasn’t a single show I could get to and be back in time for our tour. I haven’t compared schedules yet, but, you are there to be working and it’s hard to leave the tour safely. I’m going to compare schedules again and there’s much more of a chance that I can get a couple of days off to find Neil and catch a show and get back to the E Street Tour then there is for all three of us to be on stage playing somewhere. That happened last on the Vote for Change tour. It’s a great idea, but implementing it will be a happy accident, it’s a good wish that may or may not come true." I know that you recently had surgery so how is your health now? "I’m good. I had hip surgery at the end of September and now I’ve got a lot of rehab in front of me but I’m strong enough for the tour as long as I don’t start jumping off drum risers or trampolines. The surgeon and myself are optimistic that I can handle this, so I’m on the mend and doing better. The surgery was painful, but then again, not as painful as the last five years on the road. I was very lucky to have a top surgeon in Dr. Paul Pellicci from New York City. He did a great job on my hips and now it’s my job to do the right physical therapy and make them strong." You are headlining Glastonbury this year with Bruce; do you, as an American, understand the significance and history of playing that festival? "I don’t. I’ve been coming to the UK since ’72 with Neil Young. I love playing there." "Honestly, once I’m on stage with the band it’s about the audience and the music. If there’s any special things going on we’ll take it and use it. So if there is a history there that will make it a more special event then I’m all for it." "I remember walking out on stage at Wembley in 1985, Bruce counts out 1-2-3-4, and all of a sudden I realise that there’s 100,000 English fans pumping their fists and singing 'Born in the USA' and it’s July the Fourth. That was by far the most startling memory of being on a stage in England I’ll ever have and the historic significance of two countries meeting." You seem to have a showcase guitar solo song on each E Street Band tour (Youngstown on the reunion and Because the Night on the Magic tour) who decides on that in terms of arrangement? "On The Rising tour, Bruce played the solo at the end of Because the Night, but I knew I had to keep an eye on him. And once, in God knows how many shows, without any discussion, he turns to me and points at me and I play a long improvised solo. 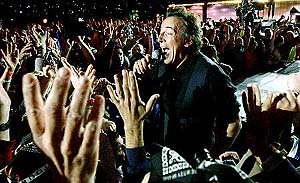 That’s the nature of the band; you always have to watch Bruce, because he might point to you once in a hundred shows. The rest of the time it’ll be him, Steve or whoever, that’s the beauty of being in the band." "However, with Youngstown, when we started playing it was a brief, intense solo and without any discussion, it got longer and longer and he’s give me the ‘keep it going’ sign. It became a two minute roaring guitar solo. We were in Washington DC and was I starting to get dissatisfied with the solo because it doesn’t have the consistency I’m happy with, so I started jamming in my basement." "I just would jam to the song and if I found special moments I’d log them. I had five or six accidental inspired jamming moments so I started putting themes together so even though I could improvise around the themes I knew that I could by the end, no matter what my improv is around it, it’s going to build and build and keep me into it and satisfied." Is there any correlation between Bruce getting older and the length of your solos? "I want to make it clear, from my perspective, that Bruce at 59, is getting stronger and there’s absolutely no thought in Bruce’s mind that he needs a break during the show. He’s one of the few people who gets stronger as the show goes on. Our two hours and twenty minute show on the last tour became three hours for most of the tour and the last show was three hours and thirty-five minutes." Can you tell me what your big solo will be on the new tour? "Don’t know yet. We’ve rehearsed Youngstown once. We played Because the Night at the rehearsal show. Out of the blue, just the other night, we played Ghost of Tom Joad and Tom Morello jammed with us. I was on my pedal steel and we did a dual solo on that song. But I won't be playing pedal steel on that song when we are on tour, I'll be back on Strat. Those are just some out of the gate that have just started; we haven’t even touched on all the new songs. So, as always it will be a work in progress with the band." Will you ever play any accordion for the E Street Band now that Danny is gone? I know Charles and Roy have covered but you have to be technically the best accordionist in the band "No. I’m the third accordion player with the band. Danny did an amazing job and I miss him terribly. Charles is fantastic, great accordionist, Roy is great, and I’m pretty good. We might be the only big rock band with three accordion players." he laughs. "Once in a while we talk Bruce into letting us all come out together. It’s actually happened a few times, so maybe this tour you’ll see it again." "We are all hams and I guess it’s inevitable that I learned accordion as my grandparents are from Nicosia, Sicily and my dad is from Sweden. Once, in Italy, when we were playing 10th Avenue Freeze Out, Bruce was doing some preaching out front and it got kind of quiet, so we snuck off stage and put on our accordions, came back behind him and on cue we played the Tarantella (a traditional Italian courtship song). The people went crazy." Do you have any plans to return to UK to play some solo shows, or perhaps bring your band over? "We found that the acoustic duo has really become a mainstay in England. Usually I do it every September/October. But because of my Bruce commitments I probably won’t be able to make it this year; however, I hope to get back to the UK and The Robin next year. My problem is those nice little theatres in England. If you take the band, you know, people just don’t want their heads ripped off, my band does that. The acoustic thing, with just the guitar, I do the ‘Because the Night’ version, it’s just an easier balance. But I’m beginning to think it’s time to take the band out again and just rip it up." Lastly, I’d like to ask you about your famous Fender Strat "Actually, I have two 1961 Strats. I got the first one back in the mid-sixties, My first proper guitar was a Telecaster because that’s what Jeff Beck played, and for me Hendrix and Beck are the two greatest guitar players ever. The other ’61 I found in a pawn shop in Berkeley when I was on the road in the late sixties. It was this ugly purple thing, but I bought it because it sounded great. I gave it to my brother Michael, who is a master carpenter, to restore it. He striped it and dyed it natural wood, and made a beautiful oak pick guard. 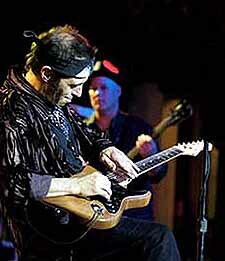 He’s responsible for turning it into this wooden-type Strat and that has become my main guitar." "The other ’61 has become my back-up. I don’t take them on the road that much on my own tours because I’m scared I might lose or damage them in a club. But the beauty of a tour of this magnitude with the E Street band is that I’ve got 35 instruments on the road and I got an amazing guitar tech, Roy, and he understands all these instruments; how to tune them and look after them." "I get to play about 20 different instruments during any one show and it’s good to know they will all be tuned and ready to go. It’s a magical adventure if you love to play guitar. I have both ‘61’s out there, the main one you see is known as my No.1 Strat, and that’s the wooden one that my brother turned into a beautiful wood piece." Thanks Nils … and have a great tour! Check out Nils' website, for as well as being able to purchase Nils’ merchandise and music, you can also access his unique online guitar tutorials; where Nils will you take you from beginner through to his mammoth three and a half hour tutorial that teaches you his incredible ‘Because the Night’ solo.